I can feel the collective stares of disbelief. 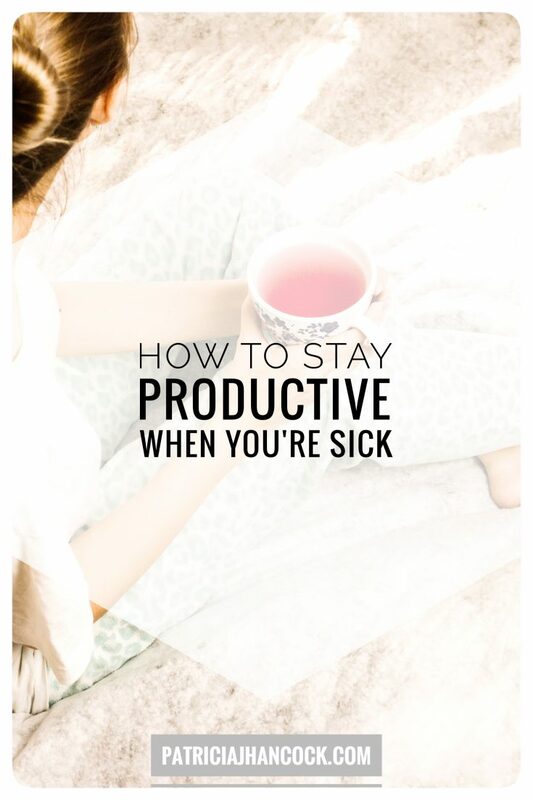 Yes, it is possible to be productive when you're sick or you don’t feel well! It’s just a different type of productive, but still gets tasks done! Does it take a bit more effort than usual? Yes. Does it feel great when you accomplish something even when you’re not at 100%? Oh, yes, indeed! Being productive when you’re not feeling well looks and feels different from the normal productive day. Not only do you have less energy, but you may be a bit mentally foggy. Whenever you don’t feel well, rest is almost always recommended. For these productive tips, you’re not going to be reorganizing the kitchen! Think: feet up, kicked back, and a full box of tissues nearby! 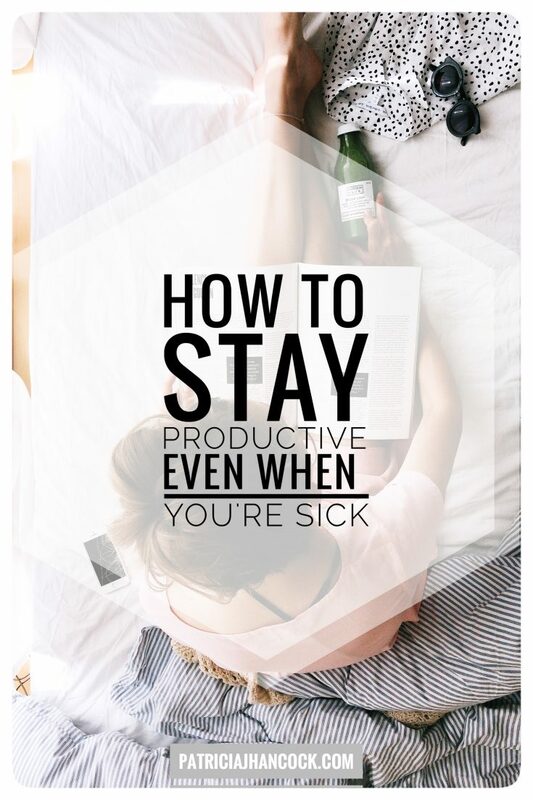 If you're looking on how to make your (non-sick) day more productive, check out my Productivity Guide. Being a recovering procrastinator, these steps are what catapulted me into a productive powerhouse! As always, these are super easy steps that you can take today to begin seeing immediate results. Even if you’re a bit foggy upstairs, reading is great way to stay mentally productive. What you read doesn’t have to be a novel, even just a short article will do. Catching up on posts and articles you may have missed during the week, or even just a short blurb of something. Keeping your mind productive is always my number one priority when I’m not 100%. If you don’t have the physical strength, by-golly, you can have the mental strength! Psst, for the really sick days, treat yourself to an audio-book. There are those days where your arms can’t hold up the book, magazine, or tablet. Let yourself doze in and out of a great audiobook when you’re at that point! This falls in line with reading but can be beneficial for the really sick days. If you’re not an audio-book fan, podcasts are another great option. If you’re zoning into the back of your eyelids for half of the day, a podcast may be more up your alley. If you’re looking for some super productive, great insights into being the best you, she's your gal! If you’re in the mood for some inspiration from some amazing women, one stop shop. When it doubt, start shuffling around your projects to days you’re not feeling drained! Illness, colds, exhaustion all add to heavier loads on other days, but that doesn’t mean that you have to pile it onto the day after you start feeling better. Snuggle up on the couch with your planner or phone and start looking at where you can plug in some of those bigger projects. While you’re in your planner, see if there’s an easy to-do that you can tackle. For me, loading the dishwasher is always at the top of my list. An easy task, but it takes some time that I may not have in the day. On your to-do list, look at the ones that don’t require a lot of muscle or energy. Just the little ones that can get done while you’re on the mend. Polish the silverware, organize the junk drawer, go through the mail, so on! Now, staying touch doesn’t mean just aimlessly paging through Facebook. This is using your sick time to connect with the people in your life that may or may not always fit into the daily chit-chats. Calling them, sending a text, something that connects you with that so-and-so who you haven’t talked to in a while. Remember, any time you’re not feeling 100%, the most important thing to do is rest and hydrate. But I know how difficult it can be just to sit, you want to get up and go about your day. Allow yourself to get better quicker, and with these tips you’ll stay productive without having to exhaust yourself. If you're looking for simple steps to take to increasing your productivity when you're not sick, check out my super easy to implement Beginner's Guide to Productivity for simple steps to get you optimized!